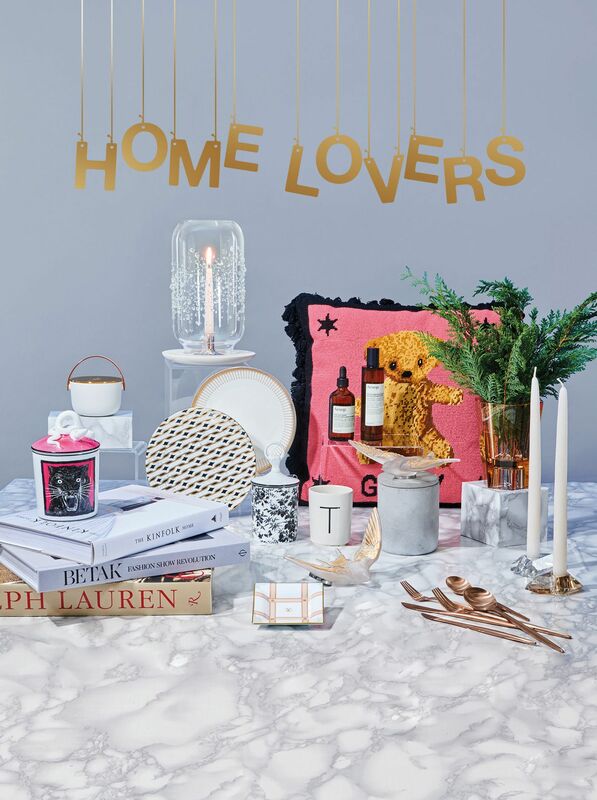 'Tis the season to give the home a stylish makeover and all you need is a bit of inspiration to find that perfect gift for your interior design-obsessed friend. Referencing star formations and the colors in galactic photography, this crystal adorned lantern adds a furturistic touch to your home with a sense of occasion. Inspired by nature's scents, the L’Air du Jardin candle is created by master perfumer Jacques Cavallier Belletrud, who translates the spirit of rosebuds into a fragrance that imparts a sensation of eternal refinement in the room. These plates with fine gold details are perfect for a Christmas dinner party at home and add a touch of glamour to the dining table. Cute and cuddly, this teddy cushion from Gucci is an adorable gift for adults who are kids at heart. Created using a needlepoint technique that dates back to the 17th century, this "Guccy" cushion is all about the details and bold colours. WIth a variety of fresh aromas to choose from, the aromatic indoor spray and aromatherapy oil from Aesop's home fragrance collection brings sensory enjoyment to the home. A reversible vase that can be doubled as a candle holder, this versatile piece in Light Colorado Topaz brings a comfortable warmth to the table. These sculptural candle holders are designed in muted tones with faceted crystalline elements—ideal to use with taper candles to make an intriguing display for any space. Made from the highest quality stainless steal and finished with solid rose gold coating, this six-piece cutlery set brings elegance and refinement to the dining table. Perfect for your minimalist friend, this marble candle is handmade with the use of both modern and ancient artisan techniques and is designed for easy candle refill. A symbol of freedom, these beautiful bird sculptures take the form of an intricately detailed swallow inspired by René Lalique's drawings. Just a few of them can easily turn the home into a work of art. Adorned with Louis Vuitton’s new Monogram Eclipse canvas, this versatile valet tray is handy for storing everyday objects—a thougtful gift to help your loved ones get organised. Simple yet personal, the alphabet cups are a great way to personalise a morning brew. Embellished with motifs of the House, the candle collection features the scent Esotericum, which combines the bitter aroma of Seville oranges with the intricacies of jasmine, finished with warm notes of leather and salt. A coffee table book that tells the life and work of Ralph Lauren by the man himself, this is a special gift that gives a rare glimpse into one of the most accomplished designers' lives. A lavishly produced volume that offers unparalleled insight into Alexandre de Betak's world of high fashion, this book unveils hundreds of unpublished behind-the-scenes images of the fashion world's most memorable shows and events—a must-have for fashion inspirations. This book features 289 full-color photographs of 35 homes around the world to reflect the key elements of slow living, which serves as a perfect reminder of what matters the most in life. A playful gift for someone who loves to have fun, this white Richard Ginori porcelain holder with the image of the black panther has a sweet message on the back that says "Soave Amore," which translates to "a delicate love". The packaging of Aerin Beauty's fragrances are so gorgeous that they can easily double as home decor. Iris Meadow is a scent that beckons with crisp green notes infued with Egyptian jasmine and deepended by warm, energising cedarwood. A good-looking pour-over coffee stand that any coffee lover will adore—the design is sleek and includes a ridged hand-blown glass dripper and a copper stopcock for easy control. Housed in a classy woven pelle tessuta leather case, Ermenegildo Zegna's creation is no ordinary majong set. This is a perfect gift to add a bit of excitement to nights spent at home with friends.